For years my girlfriend Libby has wanted to do a couples costume. Now she loves two things; Halloween and Gina Davis, so what came to mind? Adam and Barbara Maitland from Beetlejuice of course! I am no stranger to making costumes, and have created The Fly, a full size LEGO Man and two Rock ‘Em Sock’Em Robot costumes. 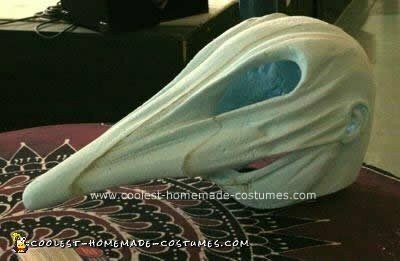 I have no qualms about barely being able to see out of a costume if it looks awesome, but since I was making a mask for her as well, and she is rather small, it was important to keep the costume simple, easy to dance in (her prerequisite), and most of all light weight. Since I was pressed for time I decided to use high density construction foam, available at Lowe’s or Home Depot for about $13 for an 8’x4′ sheet. I looked up some photo reference online for the masks and got to work. I cut the sheet into squares larger than my head and used Liquid Nails to glue the pieces together. When it dried I used a drywall saw to carve out the main shape of the Adam mask. I then used the saw as well as a Dremel drill to carve out the head cavity. Then, using coarse sand paper and those spongy sanding blocks I began carving out the stretches and creases. Sandpaper eats this foam like butter, and it is very easy to get great details very quickly. I used the Dremel drill to carve out the eyes, nose and mouth holes. The hand on the top of the head was added later from a second piece of foam and glued on. It was them painted in acrylics and faux fur added for the hair. 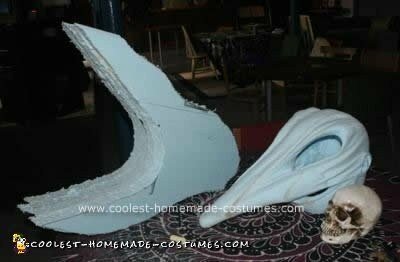 For the Barbara mask I carved the large “C” shape of the head out of 4 pieces of foam. For this one, before I glued them together, I carved out a pre-existing head hole because drilling the hole out after it was all glued together took a long time. This new way proved much easier and quicker. After the pieces were glued together it was a matter of going in with the sanding again. I started my ‘mapping out’ the lip line and then drew on the gums where I wanted the teeth to go. I lightly carved out the notches with the Dremel for the gum-line and then smoothed it out with sandpaper, using the edge of the sanding block to make the divots between the teeth. I then used the Dremel to carve the details of the roof and floor of the mouth out as well as the holes in the teeth. Lastly, I carved the tongue out of a separate piece and glued it in place after making sure Libby would be able to see out over it when completed. I then painted the head in acrylics and added the wig for the hair as well as the eyes on the tongue. 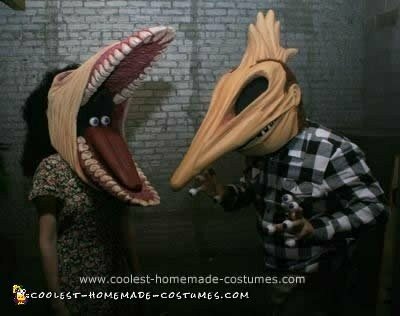 Every year we see a lot of Beetlejuice costumes, but the Stretched Faced Maitlands are in rare company. Looking them up online yields about 3-4 couples who have made these, and none to this caliber. Why there are no latex masks of these I have no idea, but I am glad there aren’t any. These were a blast to make, and relatively easy. You can make anything out of foam and it is strong, lightweight, warm and cheap. What more could you want? I highly recommend it. The one thing we were looking forward to on Halloween was seeing someone dressed as Beetlejuice. The previous year we saw a little kids dressed as one and we were hoping to see another, go up and tap him on the shoulder and ask to get our picture with him. We did end up encountering two people dressed as Beetlejuice, both women (an interesting and strange trend we have noticed) and they were just as excited to see us as we were them. When we got our pictures taken with them many people crowded around to get theirs as well. At one point the parade had to halt and the two of us linked up and danced as we waited. That must have been a site. Both masks were a little tricky to see out of; in the Adam mask I was looking out the eye holes and the nostrils, but I could not see the end of the nose, causing me to poke a couple people, but I will never let being able to see get in the way of having an awesome costume. Libby could see straight, but had bad peripheral vision, and I had to remind her if someone said something to her from the side to turn slowly or she risked clothes-lining them with her huge jaws. We stuck close to each other and watched out for the other and didn’t have too many problems. The Nose on Adam proved very handy for pushing through crowds. We went to a party on Friday night with some friends from out of town, one of whom went as The Shadow (who Alec Baldwin also played) and we were Team Baldwin all night. The thing that was the most enjoyable was that the masks were easily removable, meaning that when people came and talked to us about how I made them, I could take it off and show them the inside and such. 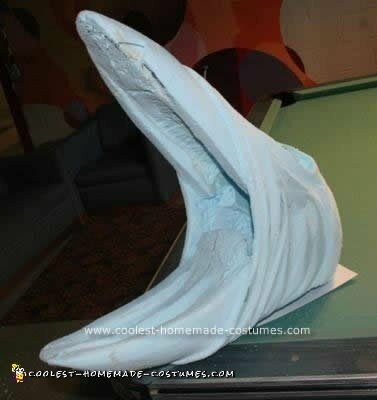 So many people were astounded I made these myself, and I encouraged them all to try their hand at carving this foam. It wasn’t just about ‘Look what I can do’, it was about “I did this and you can too!’. All in all, despite the limited visibility, the masks were extremely easy to move in because they were so light weight. We could hear out of them fine and since they were essentially just helmets we had full range of motion with our bodies. They were also quite warm, which was good since it was really cold the night of the parade. outstanding! most likely the best costume i’ve seen this year! Absolutely love this I have wanted to be this since I was little kid! You did an amazing job! I’m skeptical to try since I know it just won’t compare! WOW these are AMAZING! You are truly talented and creative. Excellent job! I am super impressed! I own a costume hire shop and am always after unique and interesting ideas to keep my shop fresh. I stumbled over this one and I think you have done a fantastic job with these. As a Beetlejuice fan these characters are near and dear to my heart and I can say you’ve done them justice. Well done! I can’t praise this enough. Great choice and perfectly executed. Do quit your day job! Where do you get this “high density construction foam” that is material like that in your pictures? I’ve called several Home Depot and Lowe’s locations and they are unfamiliar with this type of foam. Does this foam have a different name and how thick were the pieces that you bought? This is amazing. I make my own Halloween haunt decorations. These are fantastic, at first glance I thought they must be store bought (or the actual props from the movie! )Great job. Amazing work! A well done tutorial as well for anyone who wants to try to recreate it. I intend to do this couples costume in the future. This is by far the best one I have ever seen. Man… that has got to be the coolest thing I’ve ever seen!!! I wanted to be The Maitlands this year… but after seeing this… I have no faith in myself anymore. YOu did such an amazing job!! I want it.. I want to mount them on my wall!! I would love to buy these from you. Are they for sale?? If so , how much?? Would you be interested in selling? Do you still make these? Is there any way I can buy these? I would like to order this set. My family has an Oscar Awards party every year and we dress up as any movie character from any movie of our choosing. This year my idea was the husband and wife from Beetlejuice. If we can pull it off my niece will be Lydia and my step son will be Beetlejuice. We’ll have the whole group. Anyway, I was looking around and found your costumes and they are awesome! I am not crafty at all! My question is can you make another set and sell them to me? We will definitely win best costume. Would love to hear from you!